Purely for this post a young person is classified as 30 years and under. 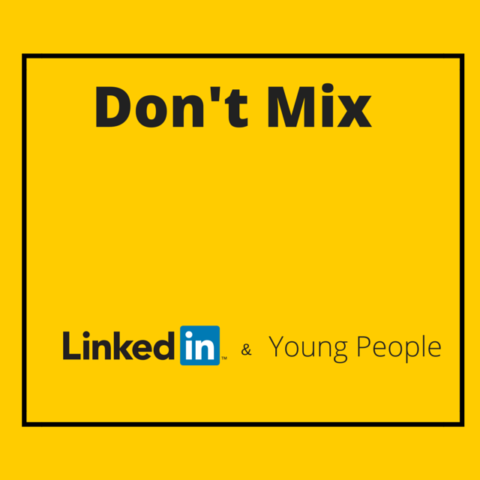 How I come to the conclusion that Linkedin and young people don't mix. The majority of young people use social media, using social networking sites daily to keep up to date with their friends, daily news and events. They naturally gravitate towards sites that they feel comfortable socially networking on, they like to consume content and follow brands that they love. When young people think about employment they don’t automatically become business savvy and hop over to Linkedin, they tend to still do what they know and continue to socially network on the sites they feel comfortable with. Linkedin is typically known as the professional site but maybe it’s too professional for our younger generation who as social media savvy bunch don’t find Linkedin very “social”, many don’t feel at ease on such a business-like platform. What we do know is that decision makers who are typically older generations and recruiters tend to "hang out" on Linkedin, but where do they go when they need young digital talent? That’s a definite "when" because if they want their businesses to propel forward they'll need young digital talent. 80% of 18 – 24 year olds have used social media to look for work. 1 in 6 visited social media first when searching for employment opportunities. Twitter was the most popular form of social media for this purpose. Read the original source “How do young people use social media to look for jobs” Reprezent is a leading youth engagement Social Enterprise working across London. Linkedin isn’t the first point of call for young people, you can’t blame them, the platform has a reputation of being a place for old people. The average age of a Linkedin user is 44.2 yrs, according to Pew Linkedin attracts an older demographic, many connections are people retired from business altogether. One of the ways young people like to navigate on the social networking platforms is via hashtags, it helps them to find what they’re looking for effortlessly. The young generation like to get things done fast, they like to research the best job opportunities fast using hashtags, as well as using hashtags to get their message in front of the right people. Linkedin had hashtags but then took them away! But Linkedin wanted to attract the younger user because it lowered its registration age to 13 and launched university pages, so why did they take away the hashtags? Do you know a 13 year old who uses Linkedin? If a 13 year old confessed to using Linkedin they'd probably get some funny looks from their friendship group, because most of them wouldn’t know about Linkedin. For the minority confessing to using Linkedin it would demerit them of any street cred, it’s the equivalent of saying they prefer Radio 4 to spotify or Bloomberg to Netflix! For teenagers Linkedin definitely isn’t their platform of choice, Instagram is where they like to hang out, it’s a place where they happily communicate in hashtags. You might not be concerned about where teenagers like to hangout online, I say you should be as they're your future employees as well as consumers. I’m not saying that our young generation shouldn’t use Linkedin because wherever they can make good connections and create opportunities for themselves they should, just don’t expect them to. If we can’t expect them to use Linkedin then employers and recruiters should investigate other platforms to connect with young digital talent.